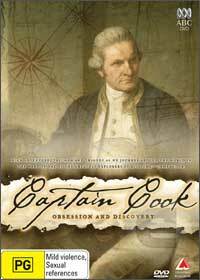 The acclaimed ABC documentary Captain Cook - Obsession and Discovery has "sailed" its way onto DVD which is based on the bestselling biography by British author Vanessa Collingridge who gives the viewer a true insight into the man that many believe made Australia what it is today. Unlike some dry and un-inspirational documentaries of similar events, Collingridge rejuvenates the tale of Cook from fact and fiction. Although the documentary is heavily steeped in historical evidence, it also shows the human side of Cook which forced his motivations and personal drive. Some aspects of Captain Cook - Obsession and Discovery is almost like a travel series with some of the places that Cook had his crew had visited. Definitely a very engaging and cinematic documentary on the man who some call a hero... and others a villain.